Jeb Bush arrived in Portsmouth, New Hampshire, prepared to answer questions about what most concluded was a poor showing in Wednesday night's Republican debate. In the most notable exchange, he accused his opponent, Marco Rubio, of missing the majority of votes in the Senate. "When you signed up for this, this was a six-year term. And you should be showing up to work," said Bush. "I mean literally, the Senate, what is it, like a French work week? You get like three days were you have to show up?" "The only reason why you're doing it now is because we are running for the same position and someone has convinced you that attacking me is going to help you," Rubio responded. Bush doubled down on his position Thursday. "If you worked at a company and decided not to show up, you would have a deduction in your pay, wouldn't you?" Bush asked in New Hampshire. "That's the real world." Bush defended his performance in the debate. "It's not about the big personalities on the stage," he said. "It's not about performance. It's about leadership." But with sinking poll numbers and recent campaign cutbacks, many political observers are questioning how much longer The one-time front-runner can hang on. Bush was asked what he made of the headlines that say his campaign is on life-support. "It's not on life-support," he said. "We have the most money. We have the greatest organization. We are doing fine." 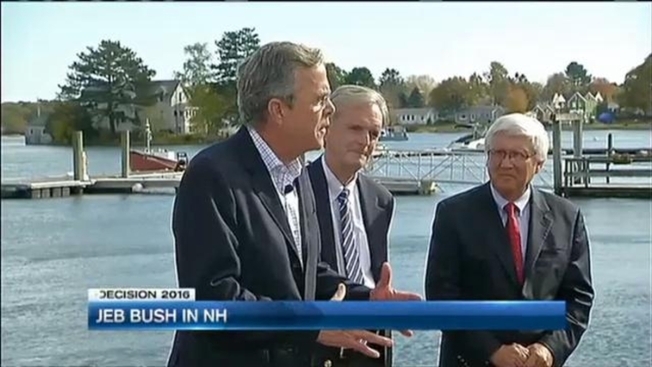 Surrounded by the new "Jeb can fix it" slogan, Bush says there is a winning strategy - to spend a lot of time in New Hampshire, build the best organization with solid advertising and to campaign with heart - Thursday, he did so with the endorsement from former Senator and New Hampshire Gov. Judd Gregg. "Governing is not done from anger," Gregg said. "Don't stand in the corners and shout. Jeb Bush has shown that he knows how to govern." Bush was also asked about reports of supporters who may be considering a new candidate. "They're not walking away," Bush said. "Look, there's eight more debates. There's ample time to do exactly what candidates do. End is not near - memo to file. Life is good." Bush is in Iowa on Saturday, then back in New Hampshire for a three-day bus tour next week.